LEINSTER CAPTAIN ISA Nacewa would have no trepidation in throwing Garry Ringrose into the international arena next month, having seen him thrive and improve with each passing match. Yesterday, the 21-year-old centre produced perhaps his most mature display yet in helping Leinster turn what looked a lost cause into a commendable losing bonus point. He not only showed his eye for a break and thirst for carrying work, but when backs were to the wall in the final 10 minutes he shot out of the line to hit Jessie Mogg and was hungrier for the resulting loose ball than Montpellier captain Fulgence Ouedraoga. Freshly showered after an intense European Cup fixture, Nacewa was asked whether his young team-mate is ready to play at an even higher level. Look, absolutely. Garry’s Garry, he takes everything in his stride. He always preaches about how he wants to get better every week and he does; he works on his game. It was pretty crucial there in the last 20 minutes and he gets better every week. “He surprises me every week in how many steps he goes forward, he works on his game hard. 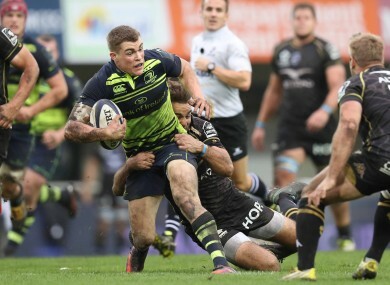 With four internationals ahead and some experience of covering Leinster’s wing as well as centre, Ringrose should be a shoe-in for some game-time in a green jersey in November. However, when it comes to the first-choice XV, it would a big leap of faith from Joe Schmidt to bring any uncapped man into a position so pivotal to the defence. Faith is worth investing in though, and Ringrose has been making a habit of fulfilling his promise over the past year. “It’s massive character, look at what Garry Ringrose did in the last 20 minutes. The impact and spark he brought to get forward momentum,” Nacewa noted before he was prompted to speak further. “Dan Leavy was sensational off the bench. We’ve got belief in our squad, belief that guys will come on and do the job. It’s a tough ask coming back from that against a good side like Montpellier but we’ll take the positives out of the last 20 minutes and build on that. “Especially away from home and especially in France (battling back against a home team’s momentum) is a tough thing to do. I think Joey Carbery really managed that 20 minutes really well and you’ve got to help your forwards out on a heavy pitch like that. The demeanour of Leinster players and coaches post-match gave credence to the idea that the end 22 – 16 result was pretty good outcome considering the way the tide was gushing for an hour. Leo Cullen, however, wouldn’t be drawn in to the grey area of ‘good defeats’. “Not really. We came here to win the game and we’re disappointed we didn’t,” said the head coach. The way Pool 4 is set up, with Leinster top of the pile yet just two points better off than bottom-placed Northampton, progression to the knockout stage remains a real possibility for all four clubs. Leinster will be hoping to force the Saints to write off that ambition before the year is out. Email “Nacewa: Ringrose's rate of improvement 'surprises me every week'”. Feedback on “Nacewa: Ringrose's rate of improvement 'surprises me every week'”.